So, I've taken up ballroom dancing these days. Thanks to Kathy at All About Ballroom, I am a dancing machine. :-) I got a taste of ballroom in college, but it just wasn't enough. I've been searching, on and off, for a few years trying to find a studio near the big city of Braselton. Shockingly, there were none to be found. Then, out of the blue, I get an email from my mom saying she's taking Swing Dance classes. She sent me a link to Kathy and I was all on board. My reintroduction to dance began with a Dirty Dancing performance class. I lived out a childhood dream and got to be "Baby" for an evening. My cousin and I used to pretend to be Baby and Johnny when we were younger. Naturally, I always got to be Baby and she was always Johnny. 7 weeks of preparation led to a stellar performance, complete with hip shaking, spins, and even a lift. I had the time of my life (pun intended)! Stay tuned for a post with the video. Well, 7 weeks just wasn't enough. I'm on round two of performance classes. This time it's the Hustle. So. Much. Fun. See below for a sneak peek of the dance. 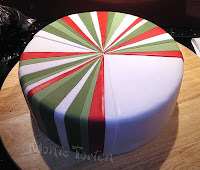 A HUGE thanks to pippilotta from CC for making a tutorial on a striped cake. I have translated it to English for those that are non-German speaking (like myself). 1. 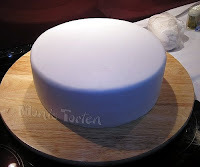 Cover the entire cake with white Fondant. 2. 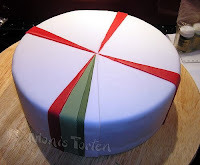 Determine and mark the midpoint of the cake with the help of parchment paper. 3. 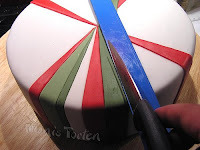 Cut strips in the desired colors (there are approximately 12-15 strips of each color for this particular cake). 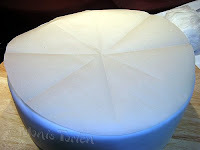 Roll fondant very thin and cut with a pizza cutter along a ruler. 4. Put the strips aside and cover with plastic wrap so they don’t dry out. 5. 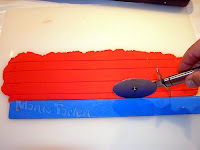 Divide cake in 4 segments using strips (example shown using red strips). Now, work within quartered segments, alternating colored strips. Use an alcohol based substance (any flavor extract, vodka, etc) to attach strips. Attach the lower edge first. 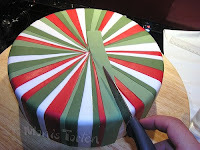 Round the strip over the top of the cake and taper the edge toward the center using a ruler and sharp knife. 6. Carefully mark the strip first with the ruler and cut off then with a sharp knife. 7. Continue placing strips within segments. 8. 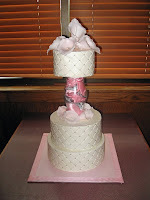 After attaching all strips, smooth surface with fondant smoother. 9. 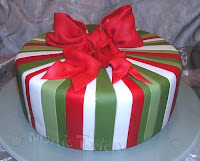 Attach a large bow on top. BEAUTIFUL!! 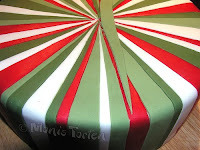 Again, thanks to pippilotta* for posting this tutorial! *Permission to translate granted by pippilotta. In my last post, I mentioned that I recently attended my grandparents' 60th Wedding Anniversary party. My grandparents have been blessed with 5 daughters, 10 grandchildren, and 7 great grandchildren (so far). Just before we ate, my grandfather stood and said a prayer to bless the food (as goes tradition). As he was standing, I took a look around the room at everyone (I think there were 23 of us). I thought to myself, "Wow! These two people (along with God's help) created all of this!" After they have gone, they will leave behind a legacy rich with tradition (even if it's only the mandatory discussion of religion and politics at every family gathering). My grandfather is most definitely the flagship of our family. He and my grandmother have been exceptional examples and role models for hard work and living a God-fearing life. They've struggled quite a bit in their lifetimes, but they have persevered and always had faith that the Lord would guide them. I am so thankful to have such wonderful examples in my life. 60 years! What a feat! I'm not sure it's possible for anyone to fully comprehend the significant impact of war. While I do not personally know anyone that has been deployed to the Middle East, I often think about and pray for our troops. I can't even begin to imagine the emotional fatigue that soldiers experience on a daily basis. Not to mention the hardship that is placed on their families while they are fighting to protect the freedom that many of us so grossly take for granted. Over the past several years, I have often wondered how I could show my appreciation for those that dutifully serve our country. Thankfully, I was recently introduced to Operation Baking GALS. I am so excited to be involved in this project. While it may not seem like much to bake up some cookies and mail them off, I'm sure there are many soldiers that are happy to get a taste of some homemade goodness. Having been abroad for several months myself, I understand the power a package from home can have. Sometimes, you just need a little reminder that folks back home are thinking of you. Don't get me wrong, I am not comparing my experience abroad to those that are tirelessly protecting our homeland. I'm just saying that I can relate - even in a small way. With all that said, I just want to send out a BIG THANKS to all of our troops! You all don't get thanked nearly enough. Baking is my way of showing support and appreciation. Bon Appetit! I've always wanted to try making biscotti. I thought it would be difficult, so I shied away from it. Oh my gosh! It was so super simple! I found a recipe for pistachio biscotti. I thought it needed a little "kick," so I dipped them in chocolate that I had flavored with cherry flavoring. A new twist on Spumoni. I had some extra left over, so I took them to work and we made homemade ice cream cookie sandwiches out of them. They were super rich, but soooooooo good! 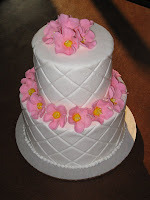 This was my first fondant covered cake (obviously). I HATED it, but that was the assignment. Being the good, little student that I am, I followed instructions. 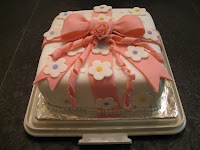 Second fondant covered cake. I was a rebel this time and completely deviated from the assignment. Not too shabby considering I had NO CLUE what I was doing! Cute idea, poor execution. 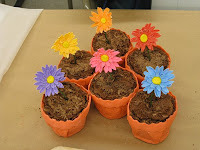 I was really busy the week I made these flower pot cakes. Considering the time constraints, I was relatively pleased with myself. I learned a great deal while doing these, so I think I'll have a better turnout with the next ones. 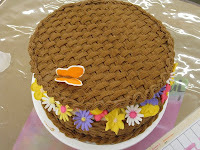 Towards the end of my cake classes, I became a rebel. I didn't like any of the assignments, so I came up with my own designs. 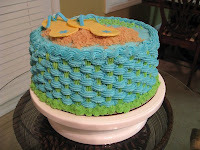 I really enjoyed making this cake. I'm not crazy about the flower colors, but I had some extra icing lying around, so I chose to use that instead of making a new batch. 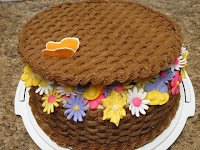 I think the butterfly is my favorite part of this cake. My very first cake order! I was given free reign on the design. I was pretty pleased with it. 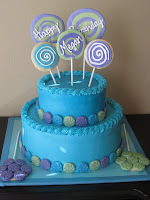 My second cake order! This was for a baby shower. 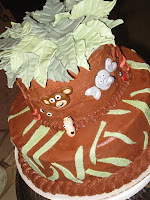 The theme was "Whimsical Jungle" and the colors were brown and sage green. Again, I had free reign on the design. 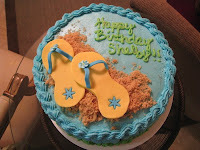 This was my "Plan B" cake. The original design was much more complex, but would not have been very stable for travel (over an hour away). I still have the sketch of the original design though. Maybe I'll get to do it someday. This is my favorite cake to date. Not only was is super yummy, it was pretty freakin' awesome, too! 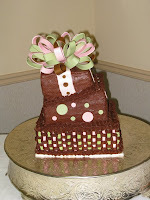 I did this cake for my stepmother's 50th birthday. 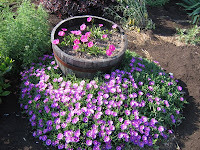 She loves hummingbirds and likes to garden, so I had my dad take a picture of the whiskey barrel in their front yard so I could replicate it. It's not an exact replica, but it's pretty close (I think). Everyone at the party didn't even realize it was a cake. Ha ha! 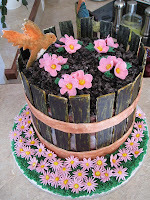 This cake was a complete DISASTER from start to finish! 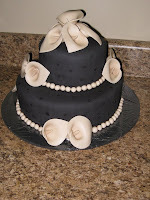 I hated this cake. It was my first attempt at Topsy Turvy. At least all the guests enjoyed it. They said it tasted great. 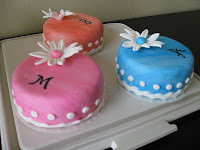 Last minute mini cakes that I did for Girls' Night. Cute, huh? 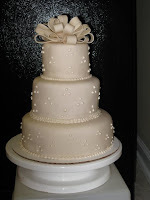 I did this cake as a sample for someone. I hated the way it turned out, so I just took it to work and let the guys in the shop eat it. I had some left over cake after a cake tasting, so I tried some new techniques. I really like how this one turned out. I took it up to the FBO when I was finished with it. I got lots of compliments on this one. 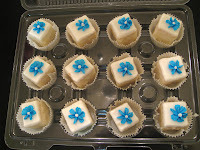 My latest experiment: Petits Fours. Since this was my first attempt at them, I was pretty pleased with how they turned out. I took a bunch to the office, some to the FBO and some to the prop shop. Everyone loved them. That's right, folks...I'm a culinary genius!! Okay, maybe that's a little exaggerated, but I have found myself to be pretty handy in the kitchen. This morning, I was really wanting some pancakes. Normally, I'm a boxed mix pancake girl, but I didn't have any in the pantry. Being the resourceful little cook that I am, I set out to find a homemade pancake recipe. After a few minutes of searching, I found what seemed to be the perfect recipe. I hurried downstairs to get right to work. After whipping up the batter, I found it to be a little runny, but thought I would give it a try anyway. The recipe says to scoop out batter by 1/4 cups. That seems a little small to me (I like big pancakes), so I whipped out my 1/2 cup scoop and plopped a big, runny scoop of batter in to the pan. Well...it's a good thing I like big pancakes because that's what I got. It was HUGE. Oops! I quickly got out my 1/4 cup scoop after that. After my first pancake came out of the skillet, I decided I wanted thicker pancakes, so I added more flour to the batter. The subsequent pancakes turned out quite well. They were so tasty, too! This recipe is so good! There's hardly need for any syrup; just a little butter. I had quite a bit of batter left over, so I made some extra pancakes and put them in the freezer for another day. That'll come in quite handy when I'm running late for work and there's no time to cook breakfast before I head out. Next time, I think I'll try macerating some peach slices in some sugar and lemon juice, then drizzling it over top of the pancakes. That sounds delicious, doesn't it? I bet you're all craving peach pancakes now, aren't you?